I always advise people buy the best paint you can afford as it'll save you time and money. For me, it's Benjamin Moore's Aura line. I love this line as it saves time and has wonderful coverage. For example, if you want to paint your dining room wall a shade of dark brown. First what you need to do after prepping the wall is prime the wall. After primer dries, then you need to put on minimally three coats and sometimes even four coats if you want to make sure everything comes out even. So minimally you are painting the exact same wall four times if not five. I don't know about you, but I don't have time to paint the same wall that many times! Aura line is great because the paint includes primer so you don't have to prime the wall. Plus because paint is thick, you really only have to paint the same wall twice or in case of light color, maybe even one time with some touch ups here and there. This is a huge time saver for most people. On top of that, Aura paint contains zero VOC. VOC stands for Volatile Organic Compound. It's basically the smelly stuff you smell from freshly painted walls to new furniture. Personally I'm not big on paint fumes so I always use Aura line paint for my own home. Aura line paint cost more than typical paint one finds at home supply stores. But to me time is money. Unless you have nothing better to do, why would you want to paint the same wall over and over again to gain full coverage? Plus you have to use more paint with the cheap stuff. 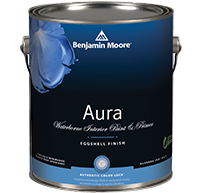 At the end of the day, you may need more cans of cheap paint which may ended up costing the same as Aura paint. For my time and money, I go with Aura paint every time.